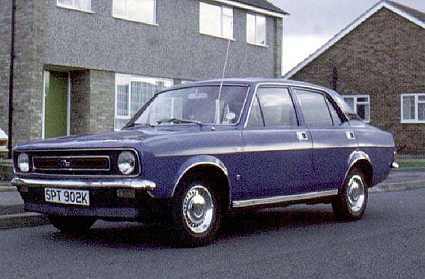 A 1.8 litre Morris Marina. What a horrible car. In order to see to reverse I had to undo the seat belt and stand up with my head pressing against the roof. The bonnet used to fly open if I exceeded 78 mph. It would wander right across three lanes on the motorway if there was a side wind. It had leaf springs at the rear and suffered from axle wind-up. The suspension was dreadful until I fitted the telescopic shock absorber kit to the front. It was actually no better when fitted as recommended (drain oil from lever arm shock absorbers) so I replaced the oil and the handling was much better with two sets of shockers at the front! It really needed trailing arms and a panhard rod at the rear but I didn't get around to that. A week after I sold it, the gearbox failed. What a heap of sh*t. Based on the old Morris Minor 1000 whose claim to fame was that it was the first car to use an electric fuel pump. You can keep it. A Triumph Herald 13/40. This had a 1294cc engine (I think that's right) and independent suspension. 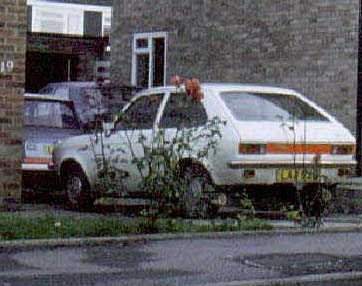 You can see the old Triumph Herald parked in front of the Chevette. The turning circle was so small that you could turn completely around in a normal (narrow) road. It was very noisy, lacking in soundproofing and had plenty of rattles. The door seals never worked so rain was a continual problem. It was easy to service - just as well since the silly plastic suspension bushes wore out very quickly. The answer to this, as with the Austin A40, was to lubricate all slow-moving parts with STP or Wynns "oil treatment". The chassis rusted at an amazing rate and we seemed to be getting new sections welded in every year. The car was quite nippy but you really didn't want to do more than 60 mph because of the wind noise, engine noise and rattles. I fitted an overdrive gearbox from a Triumph Spitfire. This was almost a straight swap except that I had to shorten the propshaft. It certainly made the car a bit quieter. It was my wife's car by the way. I didn't drive it very often. I was once a bit over zealous when shimming out the track rod ball joints. Next day my wife phoned to say that the car had "stopped suddenly all by itself". I told her to phone the RAC, not me! When she arrived back at the car from the phone box a mile away the car had moved onto the grass verge! Turned out a passing bunch of workmen had seen the car abandoned (with front wheels pointing in different directions), had looked inside and seen the battery voltage LEDs flashing (my DIY addition). They'd promptly trotted off to the nearest phone (100 yards in the opposite direction) and phoned the police to say there was a car with a bomb in it! PC Plod duly arrived, "hinspected the vehicule", and ordered the brickies to move it onto the verge - which they did simply by picking it up and carrying it - despite the "bomb". Then PC Plod went off for his tea and left the bemused navvies to guard the vehicle, at which point my wife and the RAC man turned up. My wife was not amused and I got the job of fitting a new track rod. Its next trick was to disconnect the gear lever... yes, really! I first discovered this trick while I was overtaking a lorry at 60 mph. As I flicked the lever into 3rd gear - it didn't. The gearbox locked in neutral and the lever waggled vaguely in my hand. Oops! Needless to say, the lorry driver was unimpressed by the Montego that struggled past him then slowed down to a crawl before finally bumping up a grass verge and coming to rest. By that time I had coasted two miles beyond the nearest telephone box. I had to walk all the way back in my best suit in pouring rain along a country lane without pavements. Having phoned the AA, I then had to walk all the way back because they refused to ask their driver to collect me from the nice dry telephone box. I think this was done out of spite because they remembered the Saturday morning carburettor. After only two hours, the AA man arrived. "Lost the gears?" he smiled. "They all do that. Factory forgot to fit a clip. Oops, I shouldn't have told you that!" (winking). I was unimpressed. He lifted the bonnet. "Yes, there he is. Got any wire?" "Wire? Why would I carry wire?" "Because you drive a Montego. Got a clothes peg on a string?" "As a matter of fact, it's in the glove compartment." "Hmm, good, won't need that today. I'll just get some wire from the van." He fitted two rods together and looped a piece of wire through to hold them. "Safer than it's ever been. Get the garage to fit the proper clip. Bye!" And off he went. A very nippy car but the suspension is hard and, apart from rather nice seats and fog lamps on later models, it's rather basic. Tends to rust, although the plastic trim pieces hide it better than the standard model. Use fully synthetic oil and the engine lasts forever. I got 245,000 miles out of the second one before I carelessly drove it into a trench! Why two? Well, I drove the first one through a concrete lamp post but I'd liked it so much I went straight out and bought another. I didn't carry out many modifications. Just added air horns. Headlamp washers are nice but consume water at a prodigious rate and the under-wing water bottle freezes in winter, often destroying the pump. Not much to note except that the gearbox uses a type of automatic transmission fluid. Pour in anything thicker and you won't be able to change gear!